I am in love with burlap. I love the color, the texture and the versatility. 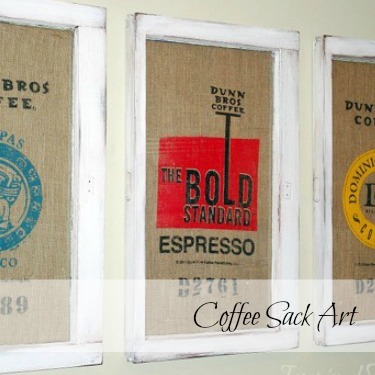 Did you see the burlap coffee sack art I just shared? It is so cool and perfect for any coffee lover! 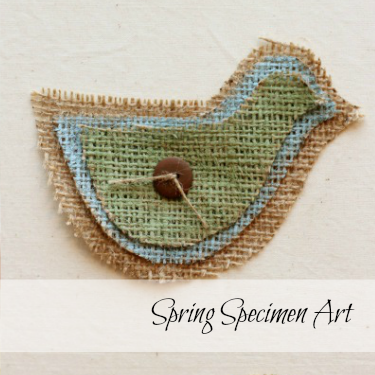 Because I am a frugal girl, and just can’t let anything go to waist, I am using the scraps from our coffee bags to make adorable Spring Specimen art. 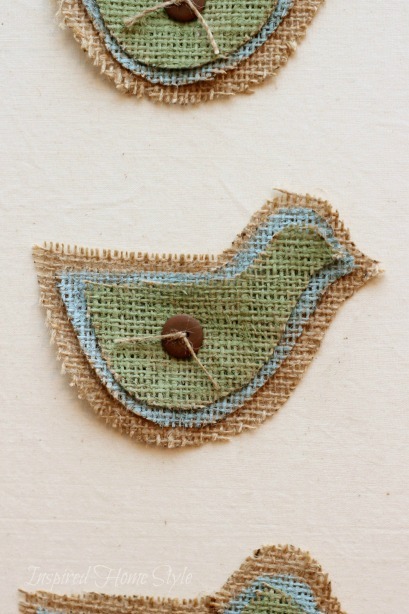 These little birds are so cheerful and the perfect way to dress up any room for spring. 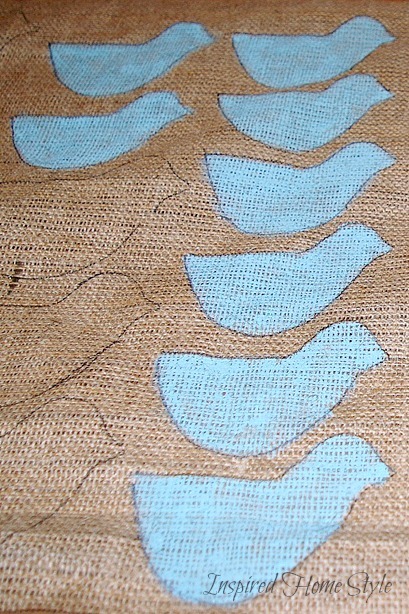 I started by drawing 3 bird templates in graduating sizes onto a cereal box and traced them onto the burlap. Easy enough! Sorry I don’t have a printable template. Next, I dry brushed blue and green acrylic paint onto the smaller birds. I love how the painted burlap looks, simple and fresh. Have I told you how much I love my hot glue gun? Seriously, I think I would be lost without it! Anyway, that is what I used to attach the layers of birds together. 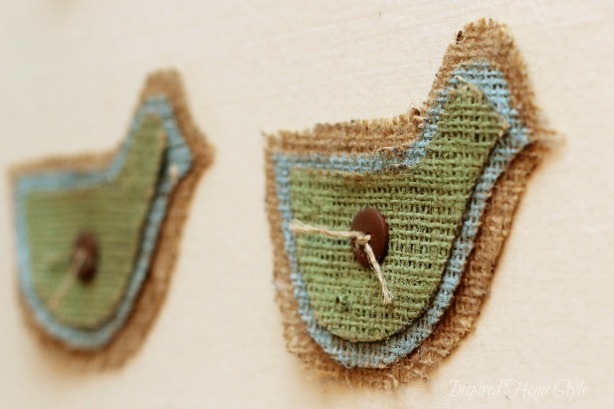 I love the finishing touch of a little button tied with burlap sting. Perfect! Fabric matting is beautiful, however also expensive. 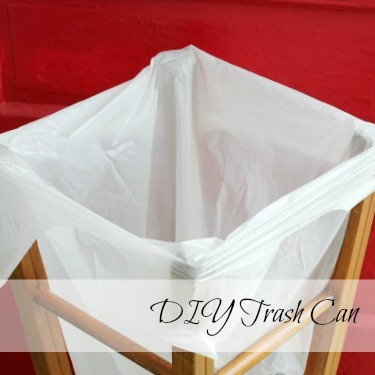 So to create the same look, I used a light weight muslin fabric and regular white cardboard. I sprayed the board with adhesive and gently layed the ironed fabric on top. All that is left, is to smooth out the wrinkles and trim the excess fabric. Simple an quick. Plus it allows me to to create the perfect matting at a fraction of the cost. 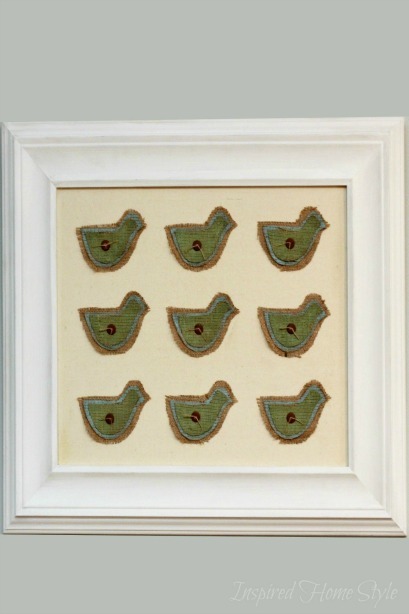 Instead of using the matting in the traditional way, the little birds are resting on top of the matting. This creates a textured backdrop for the birds and adds another layer of interest. I painted the frame white, sanded the edges and glazed over the top with a chocolate glaze. I love how this turned out. I originally shared this project on Housing A Forest, where I share creative ideas for Kids. This entry was tagged Burlap, Spring, Wall Art. These are so cute. 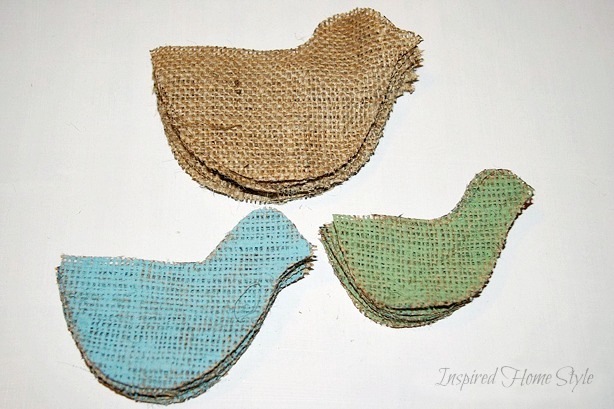 I am always on the look out for ideas to use burlap or hessian.